Discussions were recently held between Zhanjiang government and a delegation from the China Railway Guangzhou Group to guarantee that the Jiangmen-Zhanjiang section of Shenzhen-Zhanjiang High-speed Rail Line will come into service on June 28. According to Mayor Jiang Jianjun, Zhanjiang has been gifted with unprecedented opportunities for development in recent years, as it has been positioned to be a pilot city along the Belt & Road and a sub-center city of Guangdong province. Increasing demands for the local transportation network have come along with the vigorous development of local iron and steel, papermaking and petrochemical industries. 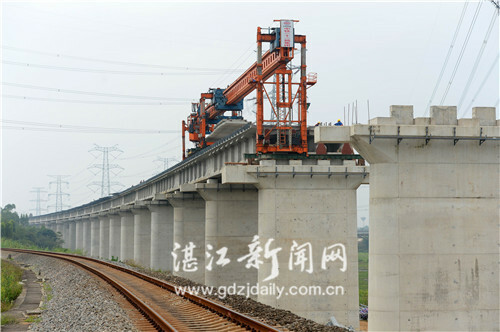 To counter this, Zhanjiang will be fully supporting rail line construction to meet growing travel demands and to promote socioeconomic development, said Jiang. The 470-km railway, which begins at the North Shenzhen Railway Station, will traverse through Guangzhou, Zhongshan, Jiangmen, Yangjiang and Maoming before arriving in Zhanjiang. With a designated speed of 250 kilometers per hour, it will slash travel time between Zhanjiang and Guangzhou to just three hours. Party secretary Zheng Renhao pointed out that Zhanjiang is mapping out its rail hub layout with the construction of five high-speed railways being a top agenda. It is hoped that China Railway Guangzhou Group will assist the city in realizing this goal in accordance with Zhanjiang's positioning. The company will further push forward with the electrification transformation of the Maoming-Zhanjiang section and construction on Jiangmen-Zhanjiang section. When the rail hub layout is nailed down, further communications between two sides are anticipated for a smooth implementation, said general manager Wei Hao.